This is our male Bombay cat named Jade. I also call him my Tuxedo cat. He was a stray who came to live with us, and when I brought him to the vet the first time, the vet told me he has all of the traits and points of a pure breed Bombay, and that he is a very special kitty. He did not have a chip (he does now), so we kept him. He is a sweet boy who I have fallen in love with and we plan on keeping him for his entire life. Editor's note: Thanks, Michael and Jane, for sharing a bit of Jade with us! He's furry handsome with his sleek back fur. :) And, of course, thank you for rescuing him! 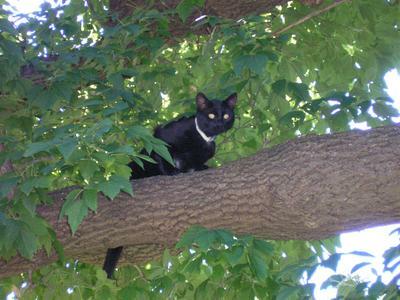 I am writing a book for children about the lesser known breeds of cat and I need a photo of a Bombay, the photo of Jade in a tree would be ideal and my granddaughter thinks it is 'cool.' How can I get in touch with Michael and Jane to get their permission? Editor's note: The best we can do is publish your comment here and hope that they're still paying attention to this page and that they respond. For more cat photos, you can also try various stock photography sites (although they have their license limitations, so check that) or community/photo sharing sites like Flickr.